For our trip in New Zealand we didn’t have to think twice about our preferred way of transportation: we rented a van for 6 weeks and loved every second of it! The freedom of having your own wheels… going everywhere you want, driving twisting (gravel) roads, pulling over anywhere you want to enjoy jet another spectacular view… Amazing! • It is a family owned business which gives you a great and personal service. When I send in a request for more information I received a friendly and personal email from owner Grant Thomlinson. He not only explained their rental procedures very clearly, but also gave great advice about hostels in Christchurch and Auckland and a list of his favorite campsites. • There is no advertising on the vans. When you drive around NZ you see a lot of campervans in all shapes, colors and sizes. What pretty much all of them have in common: they are plastered in big bold advertisements of the rental companies that owns them. Which is not necessarily a bad thing, but I really liked it that we blended into normal traffic with our plain white campervan. • Their price is the best offer I have come across in my thorough search. They explain how they keep their prices low in the FAQ on their website and I think it’s awesome they are transparent about their cost structure. We hired the economy campervan, which in our case was a nice white Nissan Vanette (check it out here). • Linen pack: I would probably bring my own sleeping bag next time. Mind you, New Zealand can be really cold at night. We woke up with snowy mountain caps one day and this was the middle of NZ summer! So a thin travel sheet isn’t going to cut it… Obviously, the major downside of BYO sleeping bag is that you have to carry it around during your entire trip. Though with a small and light sleeping bag that shouldn’t be to much of an issue. • Combo B: the only things you need are a cooler, table and chairs and a map. We had a fridge but we mostly stayed at free or DOC campsites without any power. Made having a fridge a lot less useful. The GPS is a non-essential as well! It’s almost impossible to get lost in NZ since there aren’t that many roads to begin with, particularly on the South Island. Just use your phone as a GPS (Mapswithme is a great free app. Don’t forget to download the maps of the countries you’re planning to visit before you leave?. Or ask help from one of the friendly and helpful Kiwi’s. 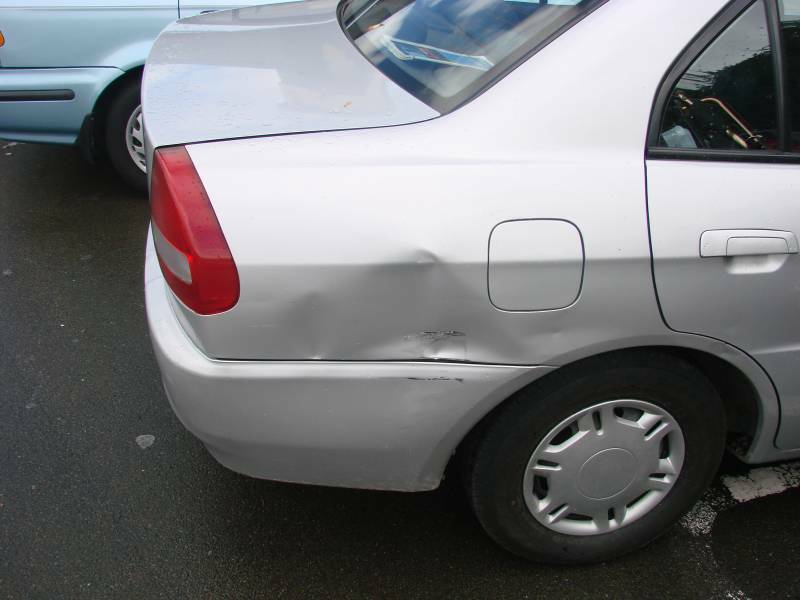 Of course you should decide for yourself if you want to spend money on insurance. We were certainly happy we did because we did not want to run the risk of having to pay up to 3000NZD dollar. My recommendation about travelling in general is to have a buffer for unforeseen expenses, say 10% of your total budget. Because a lot can (and will) happen on a long trip and it’s better to be prepared. • Additional driver: this depends on your travel situation, I really liked that both of us could drive our campervan. This meant that on the days I wasn’t driving I could fully enjoy the scenery without scaring my husband by almost driving of the road. 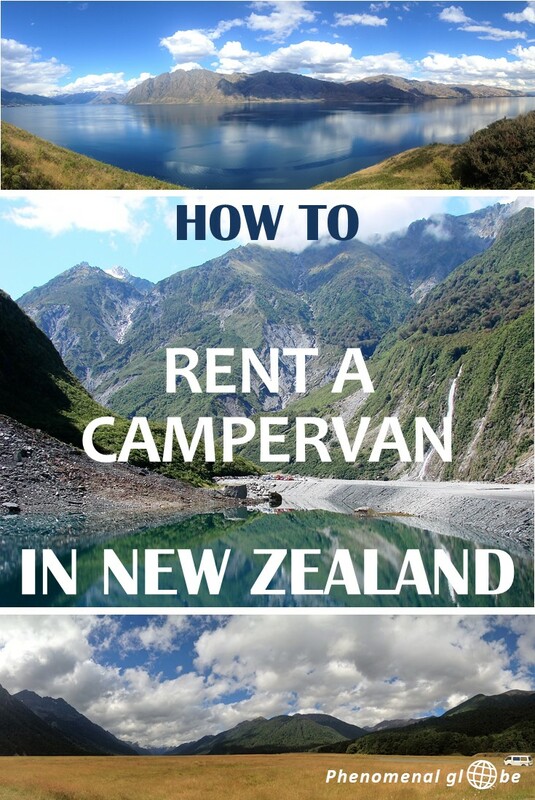 We absolutely loved our campervan road trip in New Zealand but there are several alternatives to renting a camper van. Renting a car car instead of a van is cheaper, plus you’ll spend less on petrol since mileage tends to be much better. We came across many people sleeping in their cars (mostly station wagons), but you can also buy a small tent if you prefer. 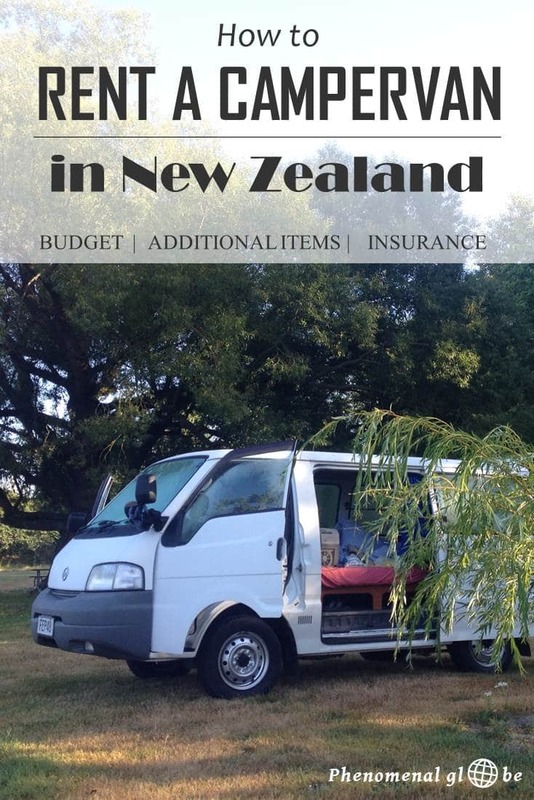 If you stay in NZ for more than 2 months I recommend buying a camper van or car instead of renting one, as rental fees really add up. For our 5 month North America road trip we bought a car in Canada and it saved us so much money! If you are interested in buying a van, send me an email! I have a 100 NZD discount coupon for you to spend at Travel Cars NZ. This company sells campervans, station wagons and small cars and also offers a buy-back option (so you are guaranteed to sell your van at the end of your trip). 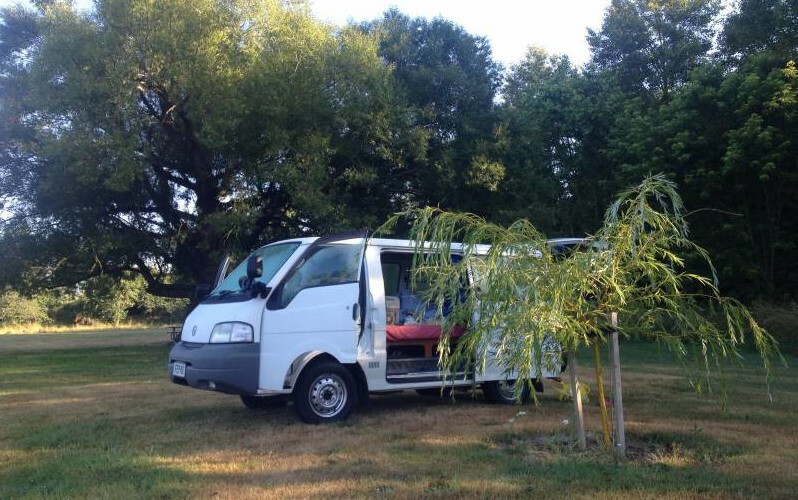 Though there is a thriving campervan market in New Zealand so you’ll probably have no issues selling your car yourself. Other alternatives include going by bus (InterCity Bus has regular 1NZD promo fees) or hitchhiking for the really adventurous. If you are an active person and don’t mind traveling slowly, you can cycle of walk across the island. There is a 3000km trail called Te Araroa starting at Cape Reinga in the North of New Zealand all the way to Bluff in the South. This way of traveling definitely brings you to places you wouldn’t easily get to by car! However, the main takeaway of this post: exploring New Zealand by campervan is absolutely amazing and something I highly recommend to anyone who loves road trips! You can download my ultimate campervan guide below. 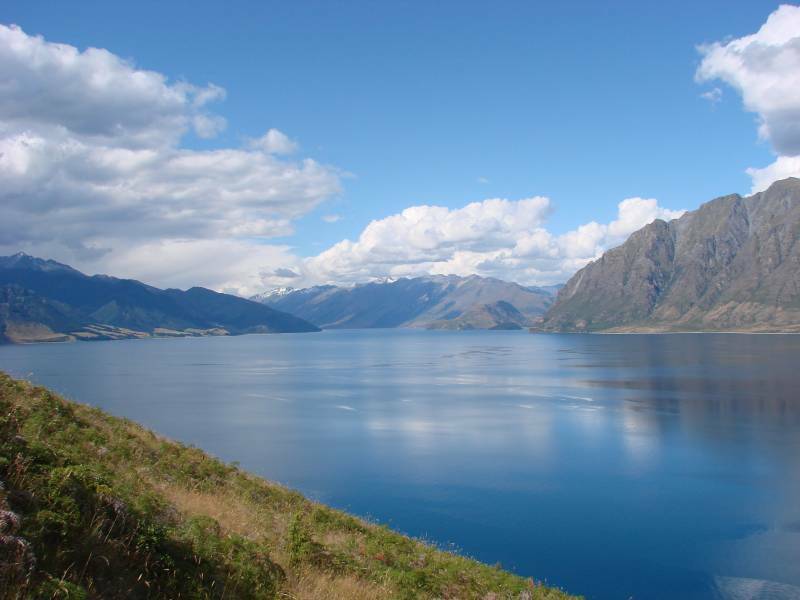 Read more about the costs of traveling in New Zealand and where to find the best campsites. 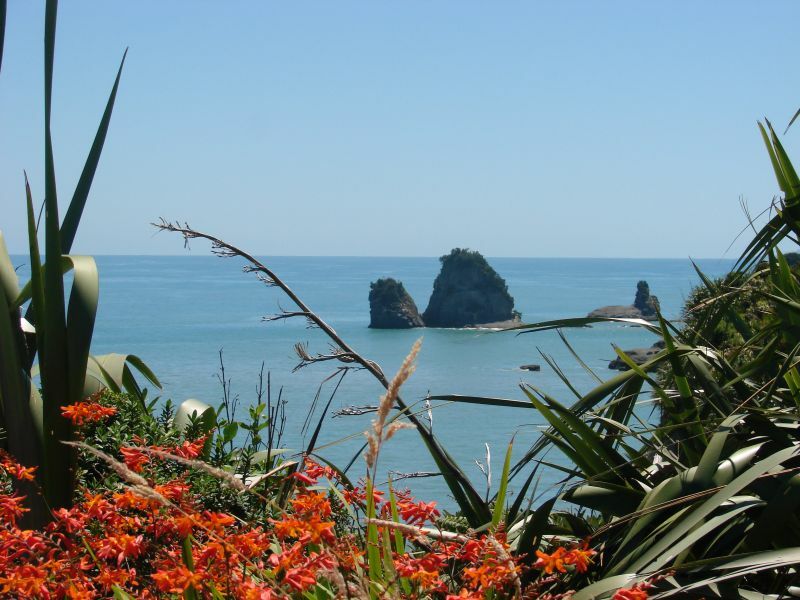 Also, check out this ‘Driving in New Zealand guide‘ by my blogger friend Isabel to read about road conditions and safety. Super useful tips guys! Sounds like an affordable way to see some beautiful stuff! Very useful tips! Great deal you got there. I was looking at ranker.co.nz. Also a very useful website with ratings of different rental companies and campsites! So this campervan is not self-contained right? And it doesn’t have dual power, because the fridge only works when your driving or have power. That’s why it’s so cheap! 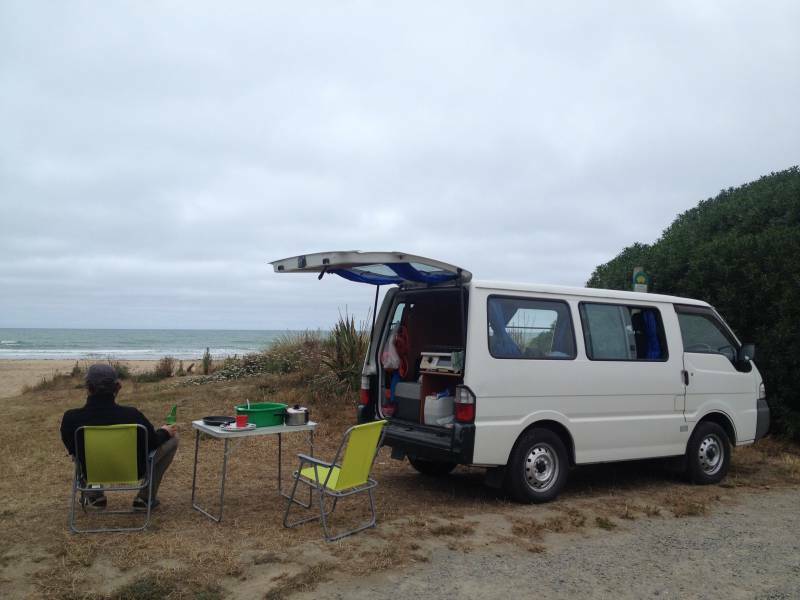 Will think about it if I’ll need it, other campervans are around 95 NZD self-contained with dual power…. That’s more expensive than this one! Hi, great and helpful post. 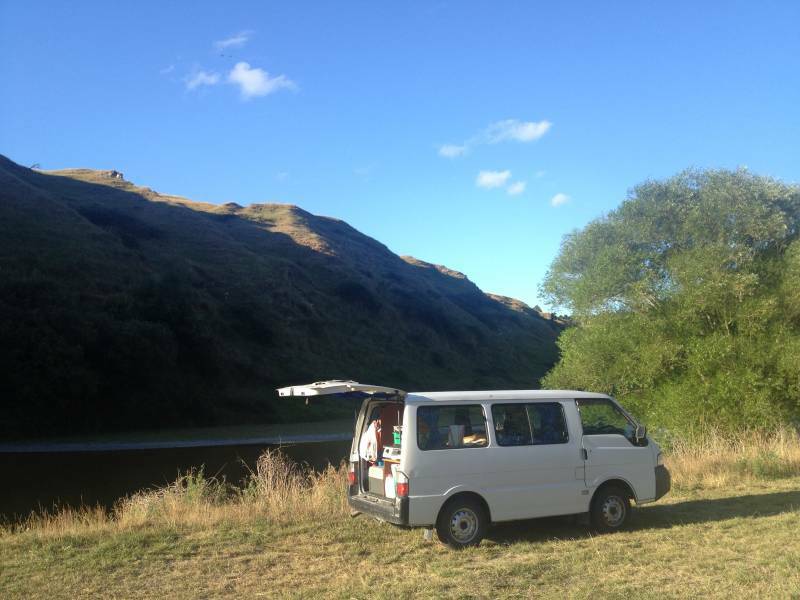 I am planning on renting a campervan as well for my one-month trip through NZ. Are there any other things you would recommend in regards of living in a campervan? How about cooking/ kitchen / washing / packing utilities, which I should bring from home or buy over there? Hey Franzi, I am happy you find the post helpful:-) Awesome you’ll be traveling around New Zealand by campervan, it truly is the best! It depends on the company from which you rent the campervan. Cooking equipment was included in our rental price, but we paid extra for bedding, a table and 2 chairs. You can do laundry at most of the holiday parks (you can check my post about campsites to see where we stayed). 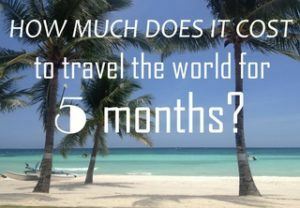 Please let me know if you have more questions and enjoy your trip! – If you aren’t using a selfcontained vehicle, where can you find toilets, are they widely available on most routes and are they clean? – Which is cheaper campervan + campsite or car+ backpacker hostel? (Self cook for both options). – Toilets are widely available in NZ and usually clean. On DOC campsites there are usually pit toilets, the same goes for the start of many hiking trails. Those don’t always smell so great but still most of them are pretty tidy. – I’m not entirely sure, I only know what we spent on our trip (see the budget breakdown here: https://www.phenomenalglobe.com/travel-new-zealand-on-a-budget/). Perhaps you can look around on the web to see if you can find a budget post written by somebody who did the car+hostel option and compare it with our travel budget.